In a letter to Rep. Darrell Issa exclusively obtained by CNN, the co-chairmen behind an independent review of September's deadly attack in Benghazi, Libya, expressed irritation over the House Oversight Committee chairman's portrayal of their work and requested he call a public hearing at which they can testify. 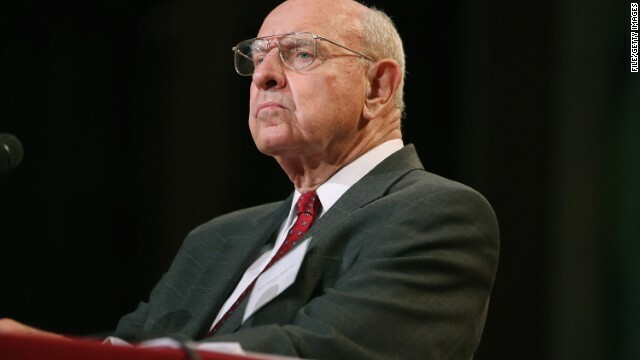 "The public deserves to hear your questions and our answers," wrote former Ambassador Thomas Pickering and former chairman of the Joint Chiefs of Staff Adm. Mike Mullen, co-chairmen of the Accountability Review Board that was convened to investigate the September 11th attack. Eight months after their report cited "systemic failures and leadership and management deficiencies" at the State Department," Issa continues to be a leading critic of the accountability board, calling its review "a failure" and asking for further investigations into the Obama administration's response during the attack and its aftermath. The dispute between Issa and the co-chairmen came to a head after neither Pickering nor Mullen attended a May 8 House Oversight Committee hearing on the attacks, sparking a heated back and forth about who was invited and when. The rhetoric intensified Sunday during a highly contentious joint appearance with Issa and Pickering on NBC's "Meet the Press" in which Issa maintained the two "refused to come before our committee." Pickering insisted that he was not invited despite expressing a willingness to testify. "Chairman Issa sent word back that he might want to take me up some time in the future" Pickering said. Issa also suggested on the program that Pickering and Mullen meet with the committee behind closed doors so as not to create "some sort of stage show." But the two assert in their letter that a public hearing is a "more appropriate forum" and accuse Issa of changing his "position on the terms of our appearance." "Having taken liberal license to call into question the Board's work, it is surprising that you now maintain that members of the committee need a closed-door proceeding before being able to ask "informed questions" at a public hearing," they write in the letter. Pickering and Mullen assert that since they are not witnesses, but rather officials asked to serve on a review board, they should be permitted to testify in public. "While we understand and respect that your committee has the authority and responsibility to review the Benghazi attacks, we ask that you similarly understand and respect that the Accountability Review Board bore its own authority and responsibility to review Benghazi," they write. "What the Committee is now proposing is highly unusual in the context of senior officials who are not fact witnesses but instead are reporting their own independent review." Last year’s attack on the U.S. diplomatic compound in Benghazi killed Ambassador Christopher Stevens and three other Americans. Pickering and Mullen have proposed May 28 or June 3 for a public hearing.